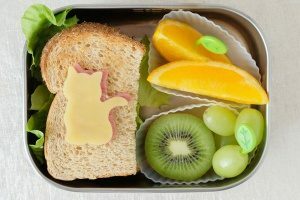 There are plenty of ways to ensure that your child is getting a safe, healthy lunch each day. Limiting sugary foods, providing them with a variety of fresh fruits and veggies, and helping them stay hydrated are all key ways to promote health. What many parents don’t consider, though, is the container in which that lunch gets packed. While many experts consider plastics to be a safe method of storing food, recent research shows that may not be the case. Many plastics can leach estrogen-like chemicals, carcinogens, neurotoxins, and other dangerous substances into food. It’s a good idea to switch to using a plastic-free container, like one of the 9 favorite options listed below. The Kangovou bento lunch boxes are the ideal container for your children’s lunches. 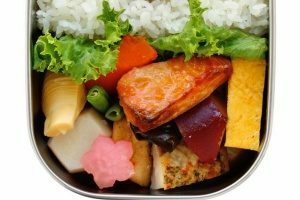 Kangovou’s bento lunch boxes are made of stainless steel, protecting your children from harmful plastic contaminants. They are also double insulated, which helps keep hot foods hot and cold foods cold until it’s time to eat. The bento lunch boxes come with adjustable dividers to help you easily maintain portion control and create nutritious lunches. Kangovou’s bento lunch boxes come in two sizes, making it impossible to go wrong with these containers. Their sturdy design ensures that you won’t need to buy another lunch container for years to come. The ECOlunchbox is actually three containers in one. It’s made of stainless steel and is comprised of two stacked levels, with a third small box that can be nested inside either one. These compartments allow children to easily carry hot and cold foods all at once. The container is dishwasher safe and is held together by sturdy snaps on each side, preventing leakage. It can even be placed in a medium-hot oven to quickly reheat leftovers for an after school snack. ECOlunchbox comes in three different sizes for every age of your child’s life. Happy Tiffin lunch systems are a classic, elegant way to carry lunch. Choose from a two-tier or three-tier system for your child. The circular containers stack and snap together, with a handled lid for easy carrying. Each tier of a Happy Tiffin system holds three cups of food, ensuring that your child will always have enough to eat. The leak-proof and air-tight containers are dishwasher safe and easy to clean. The simple design of Happy Tiffin systems makes them an excellent choice for children of all ages. With three sizes available, Planet Boxes are a great choice for big and little kids alike. The stainless steel boxes each contain multiple compartments of different sizes and shapes, making portion control easier than ever. Each box is made with a hinged lid, ensuring that you’ll never have to scrounge around to find the matching top during busy mornings. Each lunch box purchased comes with a free set of magnets to add some personality to your lunch boxes, and you can even create custom magnets of your child’s favorite movie characters, places, pets, and more for an extra special touch. Planet Box also carries stainless steel water bottles. Lunch Bots stainless-steel boxes are a versatile choice. They come in a wide variety of sizes, from small, snack-friendly containers to large, five-compartment lunch boxes that would easily pack enough food for an adult. The company also makes a variety of dip cups, thermoses, and insulated containers that can be used in conjunction with its original boxes for even more lunch time options. Lunch Bots boxes can be customized with a colorful, dot-filled lid cover, making it easy to distinguish which lunch belongs to which person before leaving the house and helping to prevent mix ups. For sandwiches, pretzels, and other loose snacks, reusable cloth bags are an excellent choice. They’re easy to store when not in use and are a perfect alternative to plastic zip top bags. Sturdy zippers ensure that, unlike the press-to-seal system on a plastic bag, the cloth bags will never open up accidentally. They also come in a wide variety of sizes and colorful patterns, making them a fun way to add a burst of style and color to lunch time. Crafty parents may be able to make a few of these bags themselves, saving money and making for a fun project to do together with your children. Famous for its water bottles and thermoses, Klean Kanteen also makes a comprehensive collection of lunch containers. This model is insulated, leak proof, and won’t absorb food flavors, making it a great option for years of use. The company is dedicated to creating safe products for families, and its Kid Kanteen line is made up of stainless steel and plastic-free baby bottles, cups, and more designed to be used by infants, toddlers, and children. This large, metal container from Sanctus Mundo has only one deep compartment, but don’t let that limit your imagination. The container is perfect for big salads, leftover one-bowl dinners like pastas and chili, and hearty sandwiches. Its leak-resistant design also has two easy-open latches, making it a good choice for sending to school with small children. Like most metal containers, this one is also dishwasher safe for easy cleanup later. The Brandenburg Classic lunch set is a workhorse. The system comes with two stacking containers, a more shallow stacking tray, and a metal lid, which are all stacked and held together by sturdy clasps on either side. The extra-large compartments ensure that everyone from teens to adults will have enough food at lunch time. Brandenburg’s extra-strength, industrial design give you the peace of mind of knowing that this container will last through several bumpy backpack rides for many years to come.